A police officer has told the trial of a man accused of planting a bomb under an off duty PSNI colleague’s car how he had to “step off the road’’ from two speeding cars he was trying to stop. The constable was giving evidence at Belfast Crown Court where Sean McVeigh (37), of Victoria Street, Lurgan, Co Armagh, is on trial and denies the attempted murder of a police officer at his home in Eglinton, Co Londonderry on June 18, 2015. McVeigh also denies possession of the under vehicle improvised explosive device. The trial has already heard that McVeigh and two other men were arrested by Gardai outside the village of Killgordon in Co Donegal in a black Volkswagen Passat car on the same date. At today’s hearing, the police witness said that he was on patrol in the early hours of June 18, 2015, in the cityside of Londonderry when he received a message over his radio. “I was asked to go to the Foyle Bridge and set up a checkpoint,’’ he told Judge Stephen Fowler QC who is sitting without a jury in the trial. The constable said that he and another patrol vehicle went onto the bridge and pulled up on the inside lane of the Foyle Bridge and “we put our blue lights on’’ and were in the process of setting up the checkpoint. “I stepped out of my vehicle and I could hear vehicles approaching from the Waterside area of Derry. “I turned around and there was a brow of a hill. I could see the headlights of a car approaching. The officer said the vehicles were “travelling so fast’’ he and his colleagues were unable to set up the vehicle checkpoint. He told the court that one of the cars was a “saloon type vehicle with a southern registration but I couldn’t make out any details of the registration’’. The police witness said the second vehicle also had a southern registration plate but couldn’t say who was in the car. He added that the two cars then headed onto the Culmore roundabout, then onto Madamsbank Road before heading towards Ballyarnett. 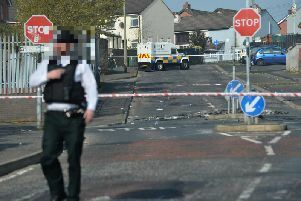 He denied a defence contention that according to a forensic engineer’s examination on the bridge, the officer could not have seen the roundabout at Culmore from where the police vehicles were parked in a lay-by at Boom Hall.